Question 1. What is sound and how is it produced? Question 2. Describe with the help of a diagram, how compressions and rarefactions are produced in air near a source of sound. Answer. Air is the most common medium through which sound travels. When a vibrating object moves forward, it pushes and compresses the air in front of it creating a region of high pressure. This region is called a compression (C), as shown in diagram. This compression starts to move away from the vibrating object.When the vibrating object moves backwards, it creates a region of low pressure called rarefaction (R), as shown in diagram. As the object moves back and forth rapidly, a series of compressions and rarefactions is created in the air leading to propagation of sound wave . Question 3. Cite an experiment to show that sound needs a material medium for its propagation. Answer. 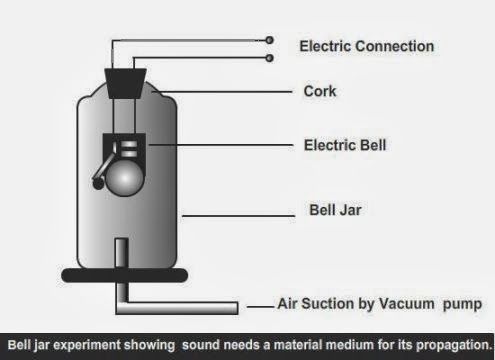 To show that that sound needs a material medium for its propagation, we can site an experiment of operating electric bell with in an air tight bell jar connected to a vacuum pump. In this experiment, we take an electric bell and an airtight glass bell jar. The electric bell is suspended inside the airtight bell jar. 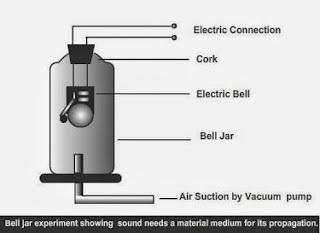 The bell jar is connected to a vacuum pump, as shown in picture. On connecting the electric bell, we can hear the bell ringing sound. Now as we start the vacuum pump and as the air in the jar is pumped out gradually, the sound of electric bell becomes fainter, although the electric bell is still connected and is working. After some time when less air is left inside the bell jar we shall hear a very feeble sound. In case, the air is removed completely, we shall not be able to hear the sound of the bell. Question 4. Why is sound wave called a longitudinal wave? Answer. As we already know, sound propagates in the medium as a series of compressions and rarefactions. These waves are called longitudinal waves. In these waves the individual particles of the medium move in a direction parallel to the direction of propagation of the disturbance. The particles do not move from one place to another but they simply oscillate back and forth about their position of rest. This is exactly how a sound wave propagates, hence sound waves are longitudinal waves. Question 5. Which characteristic of the sound helps you to identify your friend by his voice while sitting with others in a dark room? Answer. This is due to the different characteristics associated with the sound. Pitch is one of the characteristics. How the brain interprets the frequency of an emitted sound is called its pitch. The faster the vibration of the source, the higher is the frequency and the higher is the pitch, Thus, a high pitch sound corresponds to more number of compressions and rarefactions passing a fixed point per unit time. Objects of different sizes and conditions vibrate at different frequencies to produce sounds of different pitch. Question 6. Flash and thunder are produced simultaneously. But thunder is heard a few seconds after the flash is seen, why? Question 7. A person has a hearing range from 20 Hz to 20 kHz. What are the typical wavelengths of sound waves in air corresponding to these two frequencies? Take the speed of sound in air as 344 m s-1. Question 8. Two children are at opposite ends of an aluminium rod. One strikes the end of the rod with a stone. Find the ratio of times taken by the sound wave in air and in aluminium to reach the second child. Hence, the ratio of times taken by the sound wave in air and in aluminium to reach the second child is 3210 : 123, which means the sound will take 18.55 (3210 ÷ 123 ) times more time through air than in aluminium in reaching other boy. Question 9. The frequency of a source of sound is 100 Hz. How many times does it vibrate in a minute? Question 10. Does sound follow the same laws of reflection as light does? Explain. Answer. Yes, Sound follows the same laws of reflection as light does. The directions in which the sound is incident and is reflected make equal angles with the normal to the reflecting surface at the point of incidence, and the three are in the same plane. Question 11. When a sound is reflected from a distant object, an echo is produced. Let the distance between the reflecting surface and the source of sound production remains the same. Do you hear echo sound on a hotter day? Answer. As the sensation of sound persists in our brain for about 0.1 s.To hear a distinct echo the time interval between the original sound and the reflected one must be at least 0.1s. There for the total distance covered by the sound from the point of generation to the reflecting surface and back should be at least (344 m/s) × 0.1 s = 34.4 m. Thus, for hearing distinct echoes, the minimum distance of the obstacle from the source of sound must be half of this distance, that is, 17.2 m. In any medium as we increase the temperature the speed of sound increases. As the echo is being heard after getting reflected from a distant object.And also, as the distance between the reflecting surface and the source of sound production remains the same, so on a hotter day, the speed of sound will increase. As result of which, the Echoes may be heard more than once due to successive or multiple reflections. Question 12. Give two practical applications of reflection of sound waves. (i) Megaphones, horns, musical instruments such as trumpets and shehanais, are all designed to send sound in a particular direction without spreading it in all directions. In these instruments, a tube followed by a conical opening reflects sound successively to guide most of the sound waves from the source in the forward direction towards the audience. Question 14. A sound wave travels at a speed of 339 m s-1. If its wavelength is 1.5 cm, what is the frequency of the wave? Question 15. What is reverberation? How can it be reduced? Answer. 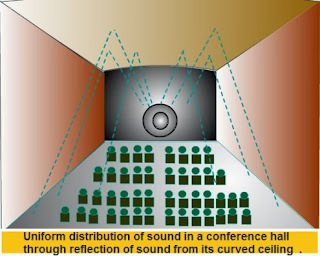 The persistence of sound in an auditorium due to repeated reflections of sound is called reverberation. In an auditorium or big hall excessive reverberation is highly undesirable. To reduce reverberation, the roof and walls of the auditorium are generally covered with sound-absorbent materials like compressed fibreboard, rough plaster or draperies. The seat materials are also selected on the basis of their sound absorbing properties. Question 16. What is loudness of sound? What factors does it depend on? Question 17. 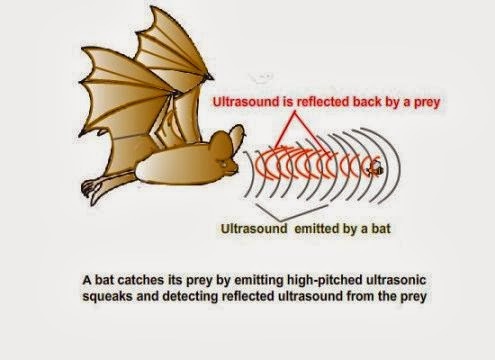 Explain how bats use ultrasound to catch a prey. Answer. Bats navigate through to catch a prey in dark night by emitting and detecting reflections of ultrasonic waves. 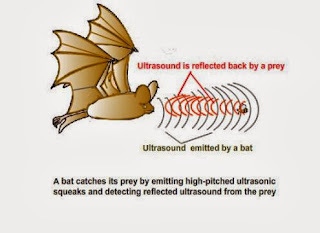 The high-pitched ultrasonic squeaks of the bat are reflected from the prey or obstacles and returned to bats ear, as shown in picture. The nature of reflections tells the bat where the obstacle or prey is and what it is like. Question 18. How is ultrasound used for cleaning? Question 19. Explain the working and application of a sonar. Answer. The SONAR is a short term for Sound Navigation And Ranging. Sonar is a device that uses ultrasonic waves to measure the distance, direction and speed of underwater objects. Sonar consists of a transmitter and a detector and is installed in a boat or a ship, as shown in Fig. The transmitter produces and transmits ultrasonic waves. These waves travel through water and after striking the object on the seabed, get reflected back and are sensed by the detector. The detector converts the ultrasonic waves into electrical signals which are appropriately interpreted. The distance of the object that reflected the sound wave can be calculated by knowing the speed of sound in water and the time interval between transmission and reception of the ultrasound. The above method is called echo-ranging. Application of a sonar finds good use in determining the depth of the sea and to locate underwater hills, valleys, submarine, icebergs, sunken ship etc. Question 20. A sonar device on a submarine sends out a signal and receives an echo 5 s later. Calculate the speed of sound in water if the distance of the object from the submarine is 3625 m.
Question 21. Explain how defects in a metal block can be detected using ultrasound. Question 22. Explain how the human ear works. Answer. The human ear is an extremely sensitive device which enables us to hear the surrounding sound through a series of compression and rarefaction of air . It allows us to convert pressure variations in air with audible frequencies into electric signals that travel to the brain via the auditory nerve. Question 1. How does the sound produced by a vibrating object in a medium reach your ear? Answer. The vibrating object creat a mechanical disturbance in the surounding medium in the form of a series of successive compressions and rarefactions . 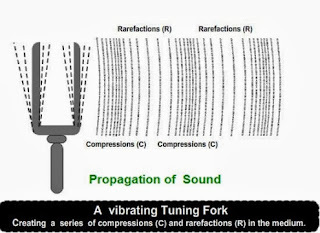 In sound propagation, it is the energy of the sound, in the form of disbance of particles of medium, that travels in the form of longitudinal wave to reach our ear. The particles of the medium do not move forward themselves. They simply vibrate about their mean position and disturbance is carried forward. Question 1. Explain how sound is produced by your school bell. Answer. Sound travels fast in metal. On striking the bell, the particles of the metal bell are are set into vibration with very high frequency. These vibrations as mechanical disturbance create waves of compressions and rarefactions in surrounding air as medium . On reaching our ears, these waves produce a sensation of a high pitched sound . Question 2. Why are sound waves called mechanical waves? Answer. 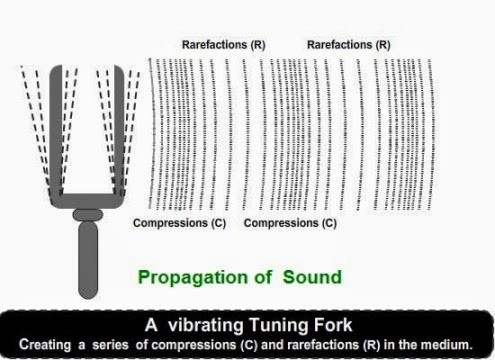 Sound is called a mechanical wave because Sound is produced by vibrating objects in the form of mechanical disturbance and needs a material medium like air, water, steel etc. for its propagation. Question 3. Suppose you and your friend are on the moon. Will you be able to hear any sound produced by your friend? Loudness : The loudness (or softness) of a sound is determined by its amplitude. The amplitude of the sound wave depends upon the force with which an object is made to vibrate. Pitch :The pitch of a sound is determined by its frequency. Pitch makes a sound distinct in hearing from other. Objects of different sizes and conditions vibrate at different frequencies to produce sounds of different pitch. The faster the vibration of the source, the higher is the frequency and the higher is the pitch. Question 2. Guess which sound has a higher pitch: guitar or car horn? Answer.The frequency of a guitar sound is higher than the sound of a car horm. The pitch of a sound is determined by its frequency. Higher is the frequency and the higher is the pitch. Thus, sound of a guitar has a higher pitch than a car horn. Question 3. What are wavelength, frequency, time period and amplitude of a sound wave? Wavelength : The distance between two consecutive compressions or two consecutive rarefactions is called the wavelength, λ. Frequency : The number of complete oscillations per unit time is called the frequency (ν). It is also represented as inverse of Time period i.e. 1 / T.
Time period : The time taken by two consecutive compressions or rarefactions to cross a fixed point is called the time period of the wave. Or in other words,the time taken by the wave for one complete oscillation of the density or pressure of the medium is called the time period, T.
Question 4. How are the wavelength and frequency of a sound wave related to its speed? Answer.The speed of sound remains almost the same for all frequencies in a given medium under the same physical conditions. The speed v, frequency ν, and wavelength λ, of sound are related by the equation, v = λv. Question 5. Calculate the wavelength of a sound wave whose frequency is 220 Hz and speed is 440 m/s in a given medium. Question 6. A person is listening to a tone of 500 Hz sitting at a distance of 450 m from the source of the sound. What is the time interval between successive compressions from the source? Question 7. Distinguish between loudness and intensity of sound. Loudness : Loudness is a physiological response of the ear to the intensity of sound. Intensity of sound : The amount of sound energy passing each second through unit area is called the intensity of sound. Two sounds of equal intensity, may be different on hearing. Question 1. In which of the three media, air, water or iron, does sound travel the fastest at a particular temperature? Question 1. An echo returned in 3 s. What is the distance of the reflecting surface from the source, given that the speed of sound is 342 m s-1? Given, Speed of sound, v = 342ms-1. In 3 s, sound has to travel twice the distance between the reflecting surface and the source of sound. Question 1. Why are the ceilings of concert halls curved? Answer.Generally the ceilings of concert halls, conference halls and cinema halls are curved so that sound after reflection reaches all corners of the hall, as shown in image. Sometimes a curved soundboard may be placed behind the stage so that the sound, after reflecting from the sound board, spreads evenly across the width of the hall . Question 1. What is the audible range of the average human ear? Answer.The audible range of sound for human beings extends from about 20 Hz to 20000 Hz (one Hz = one cycle/s). Children under the age of five and some animals, such as dogs can hear up to 25 kHz (1 kHz = 1000 Hz). As people grow older their ears become less sensitive to higher frequencies. (a) Infrasound : Sounds frequencies below 20 Hz are called infrasonic sound or infrasound. Rhinoceroses communicate using infrasound of frequency as low as 5 Hz. Whales and elephants produce sound in the infrasound range. (b) Ultrasound : Sounds frequencies higher than 20 kHz are called ultrasonic sound or ultrasound. Ultrasound is produced by dolphins, bats and porpoises. Moths of certain families have very sensitive hearing equipment. These moths can hear the high frequency squeaks of the bat and know when a bat is flying nearby, and are able to escape capture. Rats also play games by producing ultrasound. Question 01. A submarine emits a sonar pulse, which returns from an underwater cliff in 1.02 s. If the speed of sound in salt water is 1531 m/s, how far away is the cliff? Given,Time between transmission and detection,t = 1.02 s.
where d is the depth of the sea. = 1561.62 m/2 = 780.81 m.
Thus, the distance of the seabed from the ship is 780.81 m or 0.78 km.